Metamorphosis was an early stab at this, but for the color that most frequently deals with transformation, blue was surprisingly limited to Tinker-like effects. I think so long as you're not blatantly cheating something out, this is ok in both Blue at as a cheap spell. Hence the CMC restriction. But I was honestly amazed that Mask of the Mimic was the closest card I could find to this in blue. For my own costume this year, my family went Mario-themed. 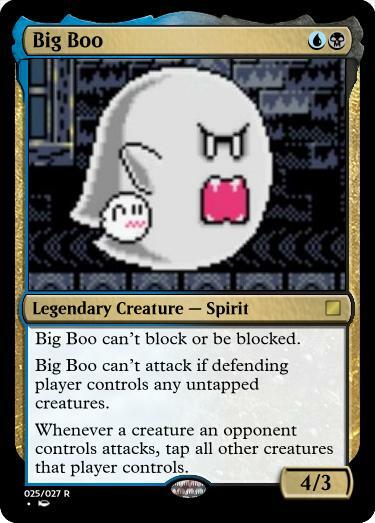 I was a Boo ghost. I knew I wanted this to be black, but I wasn't sure if it needed a second color and what, if anything, it should be. Can't block/be blocked is clearly black. Can't attack if defending player controls an untapped creature is historically red, but it hasn't been used on a card in 13 years, and longer if you discount Orgg's timeshifted reprint. I don't know that the ability pushes any particular color, but it does capture the opportunism of Black. Unified tapping is mostly just War's Toll and Magnetic Web, neither particularly recent or precedent setting. Both forcing all other creatures to attack, rather than tapping them down as a penalty for not attacking. There was a strong argument for this to be BR, but I ultimately decided that it felt a little more UB. Big Boo does really "feel" UB instead of BR. 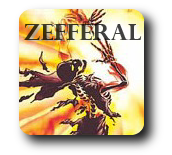 Perhaps because I'm envisioning it bringing some games to a screeching halt depending on what's in the opponent's deck. 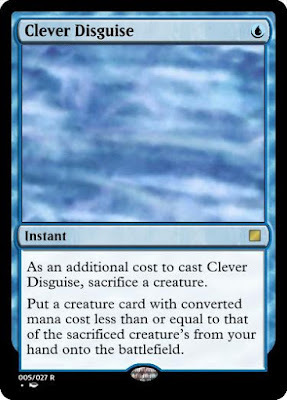 That makes it feels like you need other ways to tap your opponent's creatures so it needs to be either blue ... or white. What if WB instead of UB? White likes to "make rules," and Boos play by a fairly rigid set of rules. It is a little strange how this is bad against one creature with vigilance, but good against two. My first thought was honestly "wipe the board", which would work better in BR (and be the enemy colors of primary vigilance), but then you get a 4/3 vanilla beater for 2 which is good, but not the most broken thing in the world nor terribly exciting.